Dell announced new networking solutions to help customers deliver faster results, maximize efficiency, and modernize and transform operations in scale-out and cloud-based environments. New products introduced include the Dell Networking Z9500, an energy-efficient, highest density per rack unit, and only pay-as-you grow 10/40 GbE data center core switch available today. The new Active Fabric Controller and efforts to accelerate Network Functions Virtualization (NFV) solutions into the sector through industry consortiums and collaboration with industry partners such as Red Hat also can help customers transform and modernize data center infrastructures. Dell is helping customers upgrade data center network architectures to meet new demands imposed by virtualization, changing traffic patterns, and the nature of today’s workload needs including cloud-based and “as-a-service” offerings. By using standards-based technologies, Dell delivers architectures that help advance legacy systems, prevent vendor lock-in penalties, and future proof infrastructure for an easier transition to software-defined networking (SDN), cloud-based services, and emerging technology approaches such as NFV. The Dell Networking Z9500 Fabric Switch is the highest-density fixed-form factor data center switch with a full suite of L2/L3 routing and switching protocols. The Dell Networking Z9500 switch is designed to address data center 10/40 GbE aggregation requirements through centralized core or distributed core architectures for high performance enterprise data centers, cloud computing, provider hosted data centers, and enterprise LAN cores. The Dell Networking Z9500 is ideal for workloads such as Web 2.0, high performance computing and virtualization. OpenStack and OpenFlow hold significant promise to advance the infrastructure economics, operational, and technical capabilities of modern businesses. However, each can be highly complex and difficult for enterprise IT to adopt. What cloud administrators need is a way to simplify networking configurations while enhancing network functions for cloud-based services. Dell Active Fabric Controller is a purpose-built SDN platform designed to simply and securely configure and deploy networking functionality in cloud and XaaS environments. Dell Active Fabric Controller is targeted for enterprise OpenStack deployments and as an optional component of Dell OpenStack-Powered cloud solutions. The update offers a single, integrated solution to provide on-demand virtualized network services to OpenStack with fully automated, unified lifecycle management of the physical infrastructure. From simple plug-and-play device discovery and provisioning, automated topology and forwarding optimization, fabric wide programmability, and a simple operational lifecycle, Dell Active Fabric Controller offers a new vision for networking. Active Fabric Controller serves a fundamental building block on both enterprise control software as well as a key element of accelerating NFV deployments with its integration into OpenStack. Dell is helping bring innovative NFV solutions to market by spearheading industry consortiums such as CloudNFV and collaborating with industry partners including Red Hat. Just as SDN is increasing network flexibility, reducing costs and driving efficiency within enterprise networks, NFV can equally transform the telecommunications industry by utilizing an open, disaggregated, cloud-based approach. Dell, specifically Dell Research, recently took the leadership reins of CloudNFV, an industry consortium to develop, test and implement a cloud-based NFV model. To drive real, customer-tested-customer-validated solutions into the market, Dell and CloudNFV are working closely with telecommunications companies and standards groups like the European Telecommunications Standards Institute (ETSI) to demonstrate and perfect commercially viable, cloud-based NFV solutions. With the leadership of CloudNFV, Dell is continuing the company’s long history of championing open and standard solutions to provide customers with choice and consistency across multiple technologies. Dell also recently extended its co-engineering agreement with Red Hat announced in December 2013 to include NFV and SDN solutions built specifically for the telecom segment. “Dell is committed to changing the game in networking. As a follow on to our recent Open Networking announcement, I’m excited about demonstrating more innovation in bringing new and open solutions to our customers regardless of size,” said Tom Burns, vice president and general manager, Dell Networking. 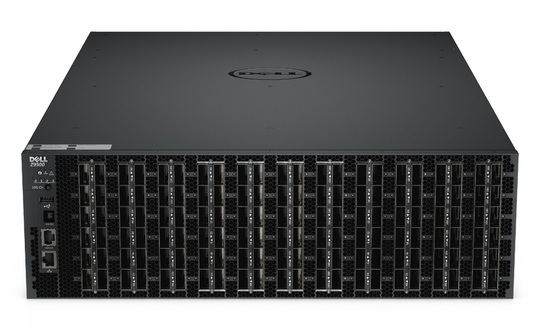 "As technology has advanced and fixed-form-factor solutions have proven lower cost, lower latency with a higher degree of reliability,” said Shane Stakem, senior director – Network Operations, Joyent Inc. “We have become believers that the spine and leaf fabric design, which Dell Networking has based on open standards, is not only here to stay but, in fact, has a substantial advantage over competing solutions such as proprietary lock-in fabrics." "Scale-out and cloud data centers are leading the transition to a more programmable, software-driven network infrastructure,” said John Fruehe, analyst at Moor Insights & Strategy. “Dell's experience in these areas, along with its strong emphasis on a standards-based approach, can be seen in these new networking products. This brings the agile benefits of these next-generation workloads to the mainstream, so businesses can drive down their network and management costs." Dell Networking Z9500 Fabric Switch is available in North America in April and worldwide in June. Dell Active Fabric Controller is available worldwide in the second quarter of 2014. The co-engineered Dell-Red Hat OpenStack-based NFV and SDN solutions are expected to be available in 2014.